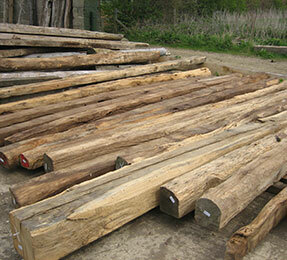 Nationwide deliveries are available for oak beams. 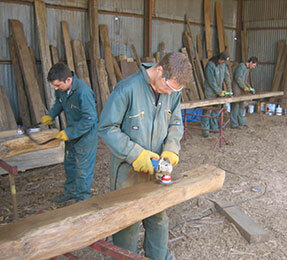 Oak beams less than 2m and up to 65kg are delivered using an overnight courier at a minimum cost of £30 inc. VAT. 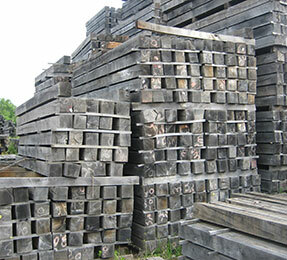 Beams that will fit onto a pallet that measure up to 4m long can be delivered via the Pallet Distribution Network. The cost is from £70 plus VAT, depending on the length of beams and distance. Orders weighing less than 2 tonnes and measuring no more than 6 metres in length can be delivered by oakbeamuk.com. This costs £150 plus VAT for half a day, or part thereof, or £300 plus VAT, for a full day or part thereof. These are indicative costs only, please contact us for more information. Follow signs to the 29th Regt. Q. What’s the difference between air dried oak and reclaimed oak? A. Reclaimed oak is older, has more character and tends to be a darker colour than air dried oak, which has not been used before and which is uniform (straight) in all its dimensions. 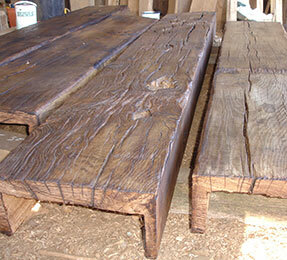 Reclaimed oak will be less prone to move or to produce “shakes” or splits but is 25% more expensive than air dried oak. Q. Why shouldn’t I use green oak? A. Green oak is prone to the greatest amount of movement and splitting. This can look both unsightly and may cause structural damage. Air dried and reclaimed oak is less susceptible to such splitting and movement. Q. How air dried is your air dried oak? A. Most of our air dried stock has been drying for at least 3 years. Some of it has over 10 years of age from its original milling. As a rough rule of thumb, oak takes about a year for every inch to dry properly. Q. Can I have my beam cut to a specific length? A. Yes we can cut any beam to a specific length dimension. Please call for an exact price. We can also cut any pre-prepared fireplace beam in stock to your required length although we will still charge for the whole beam as originally priced on the website. A. Yes we deliver nationwide by courier. Give us your post code and we will give you an exact price. Q. What happens if I am not home to take delivery? A. We do prefer you to be home to take delivery in person but if your delivery is for a small single beam then the courier will leave in an authorised place. For larger deliveries there will need to be persons available to help with offloading. We will always do what we can to help. Q. Can I come and choose a beam? A. 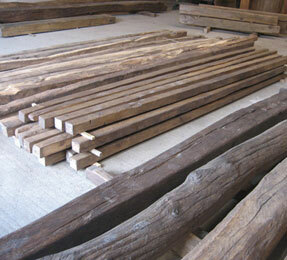 Yes, we have a showroom stocked with finished beams ready to be taken away. If you cannot find a beam you like we can prepare one especially for you. Q. How long does it take to prepare a beam? A. We ask for a minimum of a week to prepare a beam. In busy periods the lead time may stretch to 14 days. Q. Where does your oak come from? A. Our oak comes from the UK and France. Occasionally, we may source small loads from further afield. Q. Will my beam crack or split? A. Wood is a natural material and some fissures in the surface are to be expected, indeed are considered part of oak’s charm. When placed in a centrally heated environment further splits may also occur. This is entirely normal. Q. Can I buy wax from you? A. We offer touch up pots for £6.00 inc vat, 400 g tins for £12.00 inc. Vat (postal charges apply if required) and 5 litre tins for £60 inc vat. Colour tones available are dark oak, medium brown and clear. Q. What brand of wax do you recommend? A. We use Briwax, but any of the major brands, including Fiddes will do just as well. Q. What’s the difference between wax and oil finishes? A. A wax finish is only suitable for interior use and for areas not subject to damp or wetness which discolours the wax and encourages it to “bloom” or whiten. Oil is the recommended finish for all exterior use. Q. Can you tell me what size beam I need if my fireplace and / or gap is a certain size? A. No, we do not offer recommendations on size and / or load carrying capacities because we are neither qualified or insured to do so. A qualified builder, structural engineer or Architect is the best source for this advice. Q. Do you supply fixings? A. Yes – For fireplace beams we offer a range of oak corbels and also floating fixings are available to purchase.